Two-time mountaineering world record holder, Colin O’Brady, joins me in today’s episode to share his major lessons learned through hardship and adversity that served to inspire him to strive for both personal and professional excellence in his life. Not only was Colin a top level triathlete for seven years, he currently holds the world record for being the fastest mountaineer to climb the highest peak on each of the seven continents and journey to both the north and south poles (The Explorer’s Grand Slam challenge). Not only did he become the fastest person in history to do this, he accomplished this incredible feat in 139 days which was 60 days faster than anyone else had ever done. Despite being almost burned to death in a traumatic accident ten years ago in Ko Tao, Thailand and suffering serious burns to 25% of his body, Colin was able to overcome these injuries by setting small achievable goals and work toward these goals every day. In this episode, we dig into Colin’s work ethic and the specific strategies he has put into action that have allowed him to achieve excellence through his work. As well, Colin shares the work that he and his wife, Jenna, do with their non-profit organization, Beyond 7/2. As Colin states in this episode, the number one goal that they have for their organization is to inspire young people to lead healthy lives by being active and by believing in their own ability to accomplish anything that they set their mind to. Colin is wise beyond his years and his insight will surely inspire anyone listening to take more action in their own lives to be the very best that they can be. Colin O’Brady was born in Olympia, Washington on March 16th, 1985. The son of an eagle scout, Colin spent his childhood exploring the wilderness of the pacific northwest with his family. He learned about healthy living from his father, an organic farmer and from his mother and step-father, co-founders of a local, natural foods grocery chain. Through passion, dedication, and hard work, Colin grew into a youth sports star. He won Oregon State Championships and received national honors in both swimming and soccer. Colin was recruited to swim at Yale University where he swam all four years. During his time in college, Colin took a leave of absence to pursue a semester-long course with the National Outdoors Leadership School, mountaineering and kayaking in remote Patagonia, Chile. Later, while studying African economic development in college, he traveled to Tanzania, where he caught a glimpse of Africa’s highest peak, Mount Kilimanjaro. 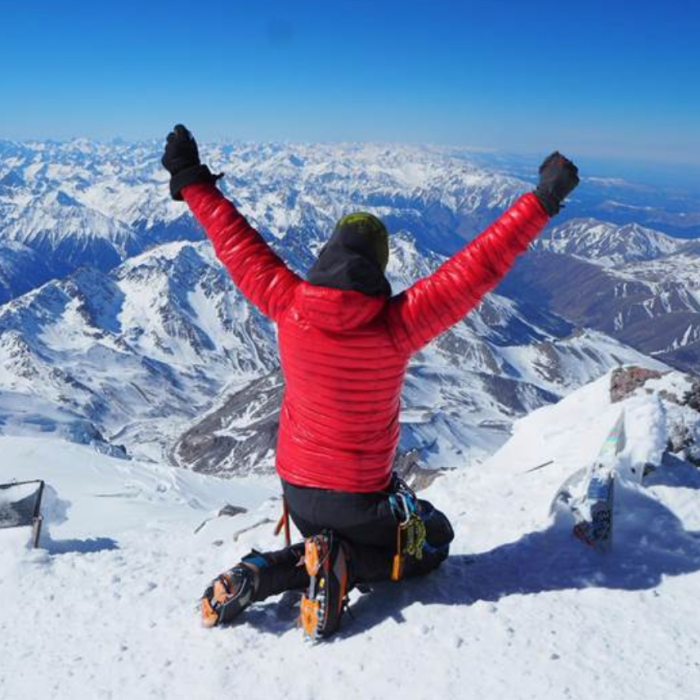 That day, a dream was born: to climb the Seven Summits. In 2006, Colin graduated from Yale with a BA in economics. The day after graduation, he embarked on a 4000-mile cycling journey from Connecticut to Oregon, with the aim to raise money and awareness for Habitat for Humanity. Before beginning his career in finance, Colin left to explore the world on a backpacking trip. While in Thailand, Colin suffered a tragic accident and was severely burned in a fire. His injuries covered nearly 25% of his body, primarily damaging his legs and feet. Doctors warned him he might never walk again normally, but Colin was determined to beat the odds. He focused not only on walking again, but set himself a goal: to complete a triathlon following his recovery. A mere 18 months after his accident while working as a trader in Chicago, Colin amazed the racing world when he placed first overall amateur at the 2009 Chicago Triathlon. His victory in triathlon sparked a new path. Colin turned pro, and fulfilled his childhood dream of being a professional athlete. Over the last five years, he has represented the United States in triathlon competitions in 22 countries and on six continents. Meanwhile, the distant peaks still called to him: Colin finally summited Mount Kilimanjaro following a race in East Africa, and climbed Mount Fuji after racing in Japan. Colin’s whole life has led him to the Explorers Grand Slam. In 2015, in addition to competing on the grueling Ironman circuit, Colin will cross-train in the mountains in preparation for a record-breaking performance. In 2016, Colin will attempt to become the fastest person ever to conquer the Explorers Grand Slam. Colin’s active, healthy childhood laid the foundation for his success as an elite athlete today. He knows that he was fortunate to be exposed to healthy principles as a youth, and he hopes his record-breaking performance will inspire children to lead healthy lives and pursue their goals. BEYOND 7/2 aims to raise funds and awareness to support programs that work to eliminate childhood obesity and promote active, healthy lifestyles.